This tutorial explains the key steps for using Bootstrap and WordPress together, integrating the latest release of the Bootstrap library with a WordPress theme. Both Bootstrap and WordPress are highly popular: 3.7 websites on the internet are built with Bootstrap and 29% of the web uses WordPress. Clearly, knowing how to build websites and apps using these two robust and mature, open-source technologies can be a valuable skill for developers in the workplace. There’s quite a lot to cover, so let’s dive in! WordPress is open-source software you can use to create a beautiful website, blog or app. The popularity of WordPress is mostly due to its ease of use and powerful options for appearance, customization, and extensibility (via themes and plugins). Thanks to WordPress themes, webmasters with little to no coding experience can power their websites with a professional appearance and custom functionality. Users can easily select different themes with a few clicks using the Appearance menu in the administration dashboard or copy theme files directly into the wp-content > themes folder. Themes can be purchased from dedicated marketplaces, individual developers, or can also be freely installed from the WordPress.org themes directory. As developers, we can create our own theme, which is what we’re going to do in this tutorial. More specifically, we’re going to perform the key steps towards building a simple WordPress theme that integrates the latest release of the Bootstrap library. Bootstrap is a robust and comprehensive UI library for developing responsive and mobile-first websites and apps. Here are some advantages of using Bootstrap as the styling framework for a WordPress theme. In my view, there are many advantages of using Bootstrap to style a WordPress theme. Bootstrap is a popular, open-source project with extensive development and continuous maintenance, which over time has resulted in fewer bugs. It has an extensive and thorough documentation. It deals with reset, grids, typography, utilities, and media queries, thereby freeing up development time. It’s widely used by developers to style websites, so it’s easy to find tutorials, demos, and open-source projects to learn from or extend. Bootstrap can be used to quickly create a mobile-first and mobile-optimized WordPress theme without reinventing the wheel. There are tons of starter themes made available by the community, such as Understrap, which aim to provide a quick starting point for developers to create WordPress themes with Bootstrap. 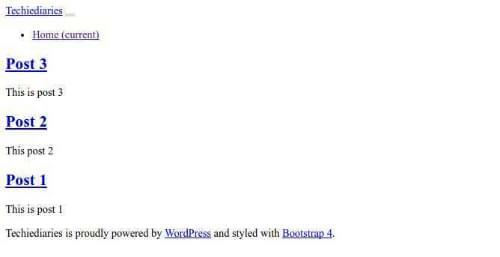 Although it’s not created with WordPress in mind, Bootstrap can be easily integrated with WordPress. We can easily customize Bootstrap to meet specific project requirements, once we have enough knowledge of the available classes. Starting with Bootstrap 4, plugins use modern ES6. With the release of Bootstrap 4, the library now uses Sass instead of Less as the preprocessor of choice, which makes it more widely compatible with a huge number of developer workflows. Bootstrap 4 introduces new components such as the card component. Bootstrap cards make it easy to create a modern, card-based layout such as the Masonry-style interface. The Bootstrap 4 grid system is built on top of flexbox, which makes the grid even more flexible, developer-friendly and clean. 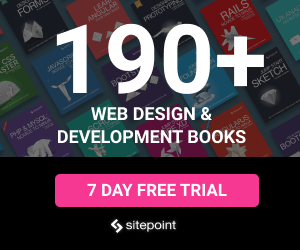 Are There Any Disadvantages of Using Bootstrap and WordPress Together? As for the disadvantages, the developer community has raised a few concerns, including the following. Bootstrap isn’t designed for straightforward integration with WordPress, but that shouldn’t be a huge obstacle for most developers. If we need to override a lot of predefined Bootstrap styles to meet the design requirements, it might not be worthwhile to use a CSS framework at all. It’s true that Bootstrap makes it easy to quickly add responsive styling to our theme. However, we also need to invest time learning about Bootstrap to be able to add our customizations so that our themes look different from the numerous Bootstrap-based websites on the Internet. Bootstrap depends on jQuery, so in some situations we might have to deal with problems related to jQuery — such as outdated plugins, or having to include the whole jQuery library, even if our project only needs a small feature like $.ajax(). In this tutorial, I assume you have a development environment with PHP, MySQL and WordPress installed — such as Homestead Improved. This quick tip will help you get up and running with a brand new Homestead Improved Vagrant VM in no time. You also need to be familiar with WordPress — particularly how to install and activate themes, add WordPress Menus, create posts and pages, etc. Finally, you need to have some knowledge of how to build a WordPress theme. 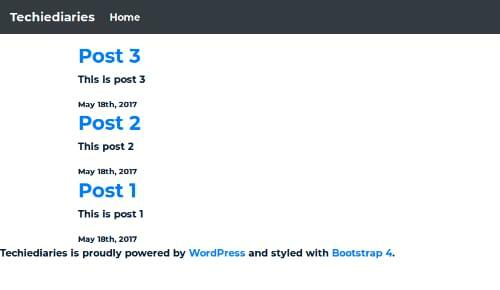 In fact, this is a tutorial on integrating Bootstrap in a WordPress theme, not a tutorial on how to build a fully functional WordPress theme, which would have a much wider scope than what we have available in this article. In this section, we’re going to learn about the key steps we need to perform to integrate Bootstrap in a simple WordPress theme project. First, let’s review which files we’re going to create. A WordPress theme has a predetermined file structure. Some files are required for the theme to be recognized by WordPress. The first required file is style.css. This CSS file contains styles for the theme. Most importantly, this file also has a special task: it provides meta information about the theme such as the theme name, description, author, and other extra details. The meta information needs to be present in the head of the file in the form of CSS comments. The other required file is index.php, which is the main WordPress theme file, and the last fallback template file WordPress relies on, in case it can’t find any other template file to display its content. functions.php, where we’re going to write the code for loading our theme’s custom stylesheet, Bootstrap styles and scripts, and more. If you’re curious, check out the other templates that you can customize from the WordPress docs. First, we head over to our WordPress installation folder and navigate to wp-content -> themes. Here, we create a folder for our theme. Let’s call it bs-theme. Let’s create our first required file, style.css, where we’re going to put our custom CSS code. Description: A Theme for WordPress with Bootstrap for styling. Now WordPress can display our theme’s info in the admin area. In the code above, most meta information for the HTML head section is added using various WordPress tags, such as bloginfo('name') for getting the site’s name, wp_title() to get the title for the page, and wp_head() to fire the wp_head action hook used by WordPress to add links and other functionality to the head section. We’ve also used different Bootstrap classes to create a responsive navigation bar. However, as it is, the navigation bar is not dynamic. That is, it’s not integrated with the WordPress menu functionality. This means that we can’t build a WordPress menu in the admin area and see it displayed on the front end of our website. Giving the static Bootstrap navigation bar the power of WordPress will be our next step. To accomplish our task, we need a WordPress walker class, which lets developers traverse tree-like data structures with a view to rendering HTML markup. There are a few Bootstrap navigation walker classes available on the Internet. For this tutorial, we’ll go with Dominic Businaro’s BS4navwalker, which is freely available on GitHub. We grab bs4navwalker.php and save it in the root directory of our theme (which we called bs-theme earlier in this tutorial). Now we can use the Bootstrap navigation walker class in our theme files. The code above assumes we’ve already created a menu in the WordPress admin area and have a few pages stored in the WordPress database. To display our navigation bar, we’re using the wp_nav_menu() function. The values for the menu and theme_location parameters we’re passing to wp_nav_menu() are taken from the settings of our WordPress menu, which we should have created already in the admin area. The values for the container, container_id, and container_class parameters are taken from the Bootstrap classes and CSS id attribute on the div element that wraps the ul element containing the list items for our navigation links. The menu_class parameter’s value comes from the Bootstrap class on the ul element. The depth parameter’s value indicates how many hierarchical levels our navigation menu is going to have. We’ve set this to 0, which is the default value and stands for all. The walker parameter is here very important, and we’ve set it to a new instance of the bs4navwalker class, which is responsible for rendering the Bootstrap navigation markup. You’ll find a detailed explanation with the full list of parameters for the wp_nav_menu() function on the WordPress.org documentation page. It’s important to note that many plugins use the wp_head() and wp_footer() hooks to place required elements in the head and footer of the page. Therefore, you’ll need to make sure to add both hooks as shown in this tutorial. Doing so will avoid breaking these plugins’ functionality when our theme is activated. Using get_header() and get_footer() instructs WordPress to include the previously created templates, header.php and footer.php, inside index.php. To show our posts, we’ll be using the famous WordPress loop. We check if there are any posts by calling have_posts(). Using a while loop, we loop over all the existing posts. Finally, we show the title and content for each post. We could also get extra information such as the date when the post is published, the author of the post, comments associated with each post, and so on. After adding our template files, we now have a good starting theme that we can activate via the Appearance menu in the admin panel. To give our theme a Bootstrap look and feel, we need to include the Bootstrap files in our project. use WordPress hooks to insert the Bootstrap files into the web page. wp_enqueue_style(): this method enqueues and loads the stylesheet passed as a parameter. In the code above, we use it to load both the Bootstrap stylesheet and our custom CSS file. get_template_directory_uri(): this method gets the URI of the current activated theme directory. add_action('wp_enqueue_scripts', '...'): this method hooks our functions into the wp_enqueue_scripts action (used when en-queuing styles and scripts that need to appear on the front-end of the website). In this tutorial, we’ve seen how to create a simple WordPress theme that integrates the latest version of Bootstrap. With this new skill under your developer belt, you’re now ready to create your own awesome, Bootstrap-based WordPress theme and share it with the world!